I’m still swimming in eggplant. I feel like I’m doing an exercise in advanced level food preservation. Putting up 500 lbs. of tomatoes is a challenge, but there are so many delicious possibilities: sauce, salsa, sweet oven roasted tomatoes… and the list goes on. Blanching and peeling 100 lbs. of peaches is a hot, annoying chore, but peach pie filling and vanilla peach jam easily justify the trouble. 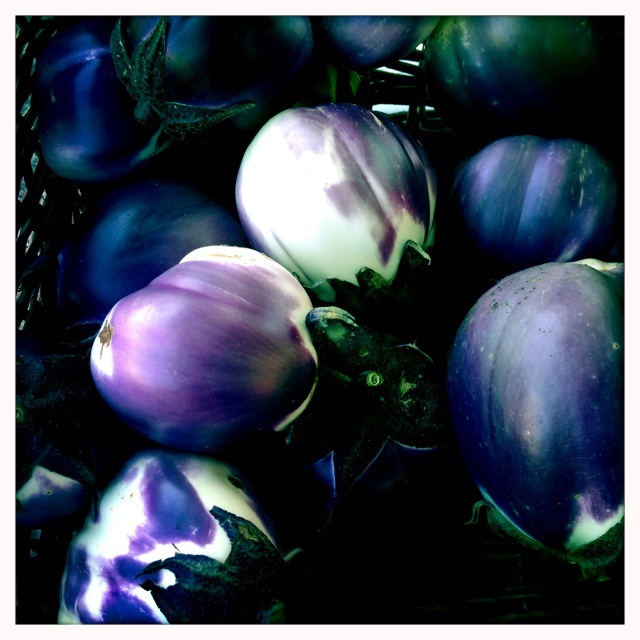 Eggplant, on the other hand…. It’s FREE. How can you argue with free? This is wonderfully versatile Italian spread. Serve it with sliced baguette for an appetizer, use it as a filling for a vegetarian sandwich with some melted cheese on top, or toss it with some cooked pasta for a quick dinner. Just like the Pasta Puttanesca I made the other day, it’s packed with olives and capers, and just like the other day, feel free to leave them out or reduce the amounts if you’re not as big of a fan. The recipe I’ve written here is my attempt at combining Mary Ann Espositos’ super authentic caponata recipe and a shelf-stable recipe from SB Canning. Cook Time: about 1 1/2 hrs. (Bring boiling water canner to a boil.) Heat the oil in a large pot on medium high heat. Add the garlic, onions, celery, eggplant, basil and parsley. Stir everything together, turn the heat to medium, and cover. Cook for ten minutes. Next, uncover and stir in the remaining ingredients (tomato paste, red wine, vinegar, capers, chopped green olives, and cocoa powder) and then cook on low until the eggplant is tender. Taste the caponata and season with salt and pepper. (You may not need to add any salt because of salt in the capers, vinegar and olives). Put lids and rings in a small pot of water and bring to a simmer, then remove from heat. 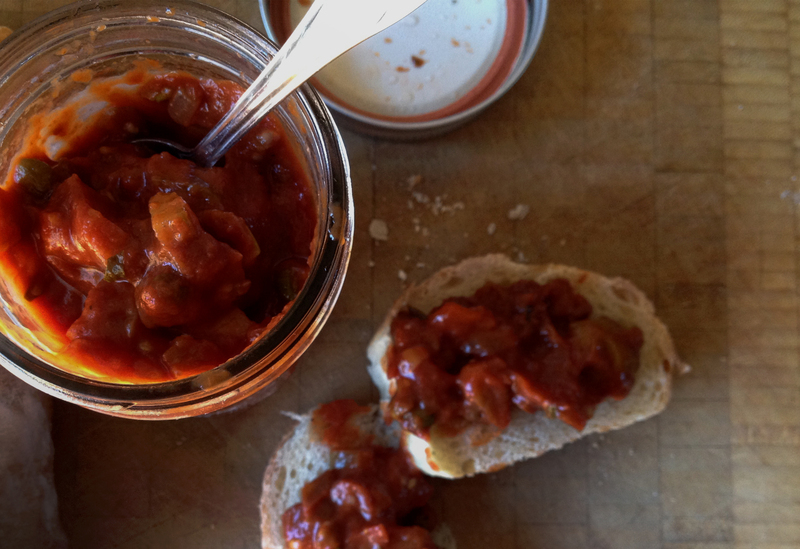 Ladle the caponata into hot, sterilized jars, leaving 1/2″ headspace. Remove air bubbles and adjust headspace accordingly. Wipe jar rims clean and screw on lids. Process half pints for 15 minutes and pints for 20 minutes (adjust for altitude if necessary). Interestng recipe… the cocoa powder is unusual. I’m guessing it adds a depth but is not apparent in the final taste?